The iBert is a groundbreaking safety product designed by parents to ensure a safe biking experience. And now with the addition of the Safer Lights strobe light, the iBert adds a new dimension of safety for your family. The iBert is a front mounted seat that offers both parent and child excellent range of vision, with the opportunity to interact as they bike together. Noted for its ease of use, the seat takes just a few minutes to install and remove, and it is equally easy and safe to load and unload the child from the seat. This adaptable seat fits any adult bike with a minimum of 3/4 inches of clearance on the handlebar stem. The iBert Safe-T seat offers a variety of safety and comfort advantages compared to other child bike seat options. 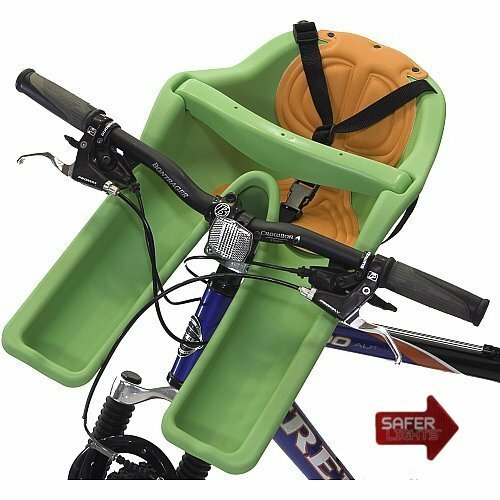 The iBert Safe-T seat allows you to maintain control of the bike when loading and unloading your child. To load and unload the child, you simply straddle the bike and lift the child into or out of the seat. When using the iBert seat you can always see what your child is doing and you can make sure that your child is safe and comfortable at all times. The center of gravity in the iBert seat is closer to the center of the bike making it easier to control the bike as you ride. The seat sits higher on the bike and is smooth on the bottom so that even tall riders rarely brush the bottom of the seat with their knees and if they do they just glide along the smooth edges on the bottom. The Safer Lights safety strobe is an easy to use safety light that clips on anywhere. Emitting a bright, red flashing light, all those who share the road with you will know your location. Shaped like an arrow, the Safer Lights safety strobe is attention grabbing and stylish. Ensure the safety of you and your child while enjoying a pleasant bike ride with both the iBert Front Mounted Child Seat and the Safer Lights Safety Strobe.